Since SFA Gardens' initial kiwifruit harvest in 2014, the expanding plot of golden kiwifruit, located on the Stephen F. Austin State University campus, has produced more than 1,500 pounds of the small, tender-fleshed fruit. The plots, which produced Texas' first successful kiwifruit harvest, are part of ongoing research led by Dr. David Creech, SFA professor emeritus of agriculture and director of SFA Gardens, to determine this fruit's potential as a commercial crop in Texas. Pictured from left to right with this year's kiwifruit harvest are Duke Pittman and Malcolm Turner, SFA Gardens technicians; Elzanne Naude, Samantha Holding, Christopher Vondergroeben and John Dilday, SFA Gardens student workers; and Tim Hartmann, program specialist in horticulture. NACOGDOCHES, Texas - Researchers at SFA Gardens are reaping the sweet rewards of their ongoing investigation into the feasibility of adding kiwifruit to the state's long list of agricultural commodities. Since the initial crop produced in 2014 - the state's first-ever successful kiwifruit harvest - the expanding plot of golden kiwifruit, located on the Stephen F. Austin State University campus, has produced more than 1,500 pounds of the small, tender-fleshed fruit. 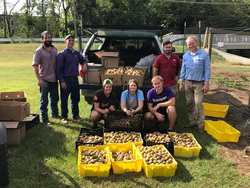 "We collected 750 pounds this year," said Dr. David Creech, SFA professor emeritus of agriculture and director of SFA Gardens. "The harvest came a little early this year, likely due to the intense heat we've had." "We check the sugar content with a refractometer, which is a hand-held tool," Creech said. "You cut the fruit in half and place some juice on the tool, and when the sugars hit a brix measurement of 10 to 12 you're ready to harvest." In 2011, Dr. Jay Spiers, associate professor of horticulture at Auburn University and a longtime friend of Creech, provided SFA with the initial 30 vines comprised of three female and three male varieties. According to researchers at Auburn University, the varieties trialed at SFA, including the AU Golden Dragon and AU Golden Sunshine, contain antioxidants that provide higher levels of cellular protection than those found in green-fleshed varieties. "When we first grew kiwis in 2011, we really didn't know a thing about them because no one had ever fruited them in Texas," Creech said. "When we fruited them in 2014 on young vines, some of my agriculture buddies thought it was a fluke, but then we had a big crop in 2015, which opened some eyes." Since that initial harvest, Creech's knowledge of the kiwifruit industry has continued to expand. This spring, Creech spent two weeks in New Zealand, one of the world's leading producers of kiwifruit, visiting orchards with a group of interested Texas investors. In 2017, he traveled to Changsha, China, to study the work of Yanoon BioTech Company's kiwifruit breeding program. Creech also spent a week in California's kiwifruit growing regions, where the ubiquitous green kiwifruit varieties thrive. "The golden kiwifruits are grown in California, but success has proven to be difficult due to the low humidity and high sunlight pressures placed upon this thin-skinned fruit," Creech said. "The higher humidity of the Gulf Coast South, less intense sunlight and wind pressures are favorable to golden kiwifruit culture." Creech said that commercial fields can produce up to 50,000 pounds of kiwifruit per acre, which requires substantial infrastructure investment in the form of support systems and trellises for the vines. "It's a real high-technology crop," Creech said. "You have a male and female plant, and it has to be the right male in terms of the time of pollen shed and stigma receptivity." Creech said that many farmers in New Zealand are transitioning to all female kiwifruit orchards and implementing artificial pollination using pollen collected from all-male kiwifruit orchards. These cautionary steps are taken because even if the female plants are fertilized, the success and size of the fruit relies on the amount of pollen transferred, and natural pollinators are not always reliable if weather is inclement during the blooming period. "When you have that kind of investment, you need to ensure good pollination," Creech said. In addition to the trial plots at SFA, new plots are being installed in northeast Texas and on the northwest side of Houston to determine if certain areas of the state are more conducive to plant growth. "It's a long-term project, like so many new crops," Creech said. "So far, we're encouraged, and we do think there is some opportunity. We have a long way to go to fully understand the technology needed to produce the kind of yields and production they get in New Zealand and California." For more information regarding this research, contact Creech at (936) 468-4343 or dcreech@sfasu.edu.